A new pre-spacewalk protocol designed to prevent the bends when astronauts work in NASA's low-pressure spacesuits worked flawlessly in its first operational use, NASA managers said after a successful six-and-a-half-hour spacewalk. 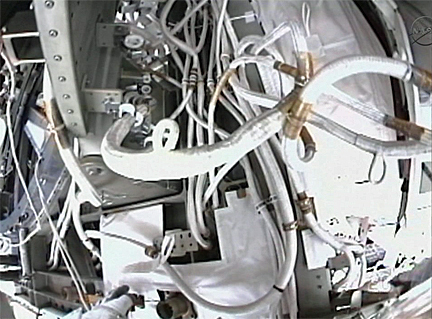 In the old "campout" protocol, spacewalkers had to spend the night in the space station's airlock at a reduced pressure of 10.2 psi to help purge nitrogen from their bloodstreams. They also had to wear oxygen masks the night before for lengthy periods. The new in-suit light exercise protocol, or ISLE, skips the overnight campout in favor of light exercise the day of the spacewalk while breathing pure oxygen. The technique was tested extensively on the ground, but today's spacewalk by Michel Fincke and Andrew Feustel was its first test in orbit. "The flight surgeon reported there were no medical issues whatsoever, no symptoms, no issues, no difference whatsoever," said Flight Director Derek Hassmann. "So he gave the crew a clean bill of health and the crew had nothing but positive feedback about the protocol." NASA managers said before launch that if the ISLE protocol worked well, they would consider using it for the fourth and final spacewalk of Endeavour's mission, an excursion Friday by Fincke and Gregory Chamitoff. But because the ISLE technique uses a bit more of a suit's carbon-dioxide scrubbing lithium hydroxide -- and because Chamitoff had problems with a CO2 sensor during a spacewalk Friday -- the old campout protocol will be used Friday. As for today's spacewalk, the only problem of any significance was a case of eye irritation that caused Feustel a fair amount of discomfort. Allison Bollinger, the lead spacewalk officer at the Johnson Space Center, said the most likely cause was a helmet visor anti-fogging compound -- dish washing soap -- that flaked off inside his helmet. "After speaking to him after the EVA, we believe this was the anti-fog," she said. "Prior to going out EVA each time, the crew members apply an anti-fog solution to the inside of their helmet in order to prevent fogging. We've seen this happen a couple of times in the past where if you're not careful about buffing the anti-fog just the right amount that it can flake off every once in a while and get in a crew member's eye. This anti-fog is actually just off-the-shelf dish washing soap. So if you've ever had soap in your eye, you know how that feels." Feustel eventually cleared it up by rubbing his eye against a foam block in the helmet that can be used to help an astronaut clear his or her ears during airlock depressurization. "He made an interesting comment that I'd never thought of before, that tears in space don't run down your face, the actually kind of conglomerate around your eyeball," Bollinger said. "He was able to rub his eye against that valsalva device to get the tears free and then he said he was able to press (on)." Astronauts Michael Fincke and Andrew Feustel returned to the Quest airlock, closed the hatch and began repressurizing at 8:37 a.m. EDT (GMT-4), officially ending a six-hour and 54-minute spacewalk. The astronauts accomplished all of their primary objectives and other than a brief hiatus when Feustel reported uncomfortable eye irritation, there were no problems of any significance. This was the 158th spacewalk devoted to station assembly and maintenance since construction began in 1998, the seventh so far this year and the third for the Endeavour astronauts. Total station EVA time now stands at 995 hours and 13 minutes while the total for Endeavour's mission is 21 hours and 20 minutes. Feustel, completing his sixth spacewalk, has now logged 42 hours and 18 minutes of EVA time, moving him up to 14th on the list of most experience spacewalkers. Fincke, completing his eighth excursion, has now logged 41 hours and 13 minutes, moving up to a tie for 18th. On Earth, it's a trivial matter to rub an irritated eye. But wearing a space helmet, it's another matter. "Just an FYI, my right eye is stinging like crazy right now," spacewalk Andrew Feustel reported near the end of a planned six-and-a-half-hour spacewalk. "It's watering a lot. Must have gotten something (in it)." 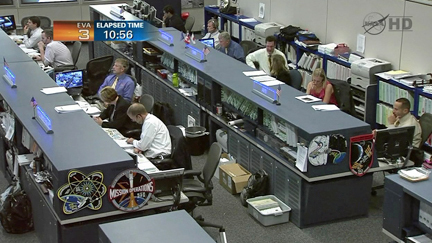 "Houston copies," astronaut Steve Swanson radioed from mission control. "Boy, that's not fun," Feustel said. "Wow." "Sorry, buddy," sympathized fellow spacewalker Michael Fincke. "Oh boy, that's (garble)," Feustel said. "Wonder if that's what mace feels like?" "You're still on the bottom of the airlock right?" spacewalk coordinator Gregory Chamitoff radioed, making sure Feustel was close to safety if needed. "Yeah. Wow," said Feustel, wondering if an anti-fogging agent might have been to blame. "I don't think you should go anywhere unless that gets better," Chamitoff said. "Yeah, I agree," Feustel said. A few minutes later, Feustel said "OK, I just rubbed my eye against the valsalva, that helped a bit." He was referring to a foam fixture in the helmet that can be used to block the nostrils to relieve pressure in the ears. "OK, feeling better." "Yeah, the rubbing helped a lot," Feustel said. "I've got my eyes open now." He and Fincke then pressed on with the final tasks on their spacewalk timeline. Astronauts Andrew Feustel and Michael Fincke have hooked up a second set of electrical jumpers to provide additional redundancy for routing power from U.S. solar arrays to the Russian segment of the International Space Station. "Nothing's stopped working on the space station, right?" Feustel joked after making one of several connections. Working in an electrical junction known as the "rat's nest" where numerous power and data cables are connected, Fincke hooked up one end of the multi-cable jumper while Feustel connected the other end at the interface between the U.S. and Russian segments. At one point, Fincke lost track of his safety tether and had to get help from Feustel to get untangled. "I apologize to the team," Fincke said. "It was dark and I was upside down." "Was it scary?" Feustel joked. "No, but it wasn't frustrating because we got the job done," FIncke said. "You guys did a great job," said spacewalk coordinator Gregory Chamitoff. "That was a difficult task." "Wait until you see the pictures," Fincke said. "They don't call it a bird's nest or some other kind of nest, it's definitely a rat's nest." The Endeavour spacewalkers have finished hooking up antennas that were installed during a spacewalk Friday and are moving back to the Russian Zarya module to connect a second set of jumpers to help route U.S. solar array power to the Russian segment of the International Space Station. The antennas enable "a wireless system to be working outside the station," spacewalk coordinator Gregory Chamitoff said in a NASA interview. "There are experiments and payloads outside the space station. They need to communicate to the data system and they're installing a couple of antennas and all the wiring for that to enable those pieces of equipment or experiments to communicate to internal systems through those antennas." 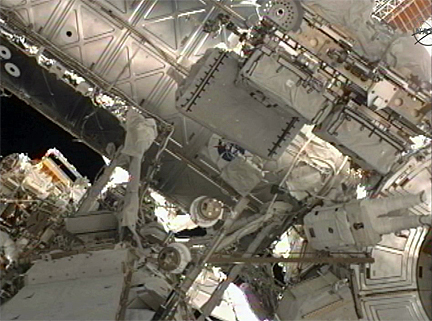 Chamitoff and Andrew Feustel attached the antennas during the crew's first spacewalk, but they were unable to finish wiring them into the Destiny laboratory's electrical system. Feustel and Michael FIncke finished the job today. As of this writing, Feustel and Fincke are running about a half hour ahead of schedule. The first of two sets of jumper cables needed to improve power distribution from NASA's solar arrays to the Russian segment of the International Space Station have been installed. 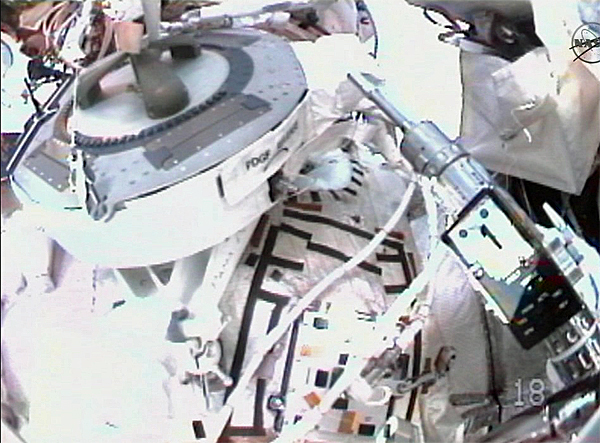 The astronauts are now moving on to hooking up to antennas that were installed during the crew's first spacewalk. So far, today's spacewalk is proceeding smoothly with no problems of any significance. Spacewalkers Andrew Feustel and Michael FIncke have mounted a video signal converter on the Russian Zarya module for use with a new robot arm attachment fitting installed earlier this morning. The next major item on the agenda is to install cabling between the Zarya module and the U.S. Unity compartment to add redundancy to the system that routes power from the station's four NASA-supplied solar arrays to the Russian segment of the lab complex. Two sets of cables are required, one tied into power distribution channels 1 and 4 and the other connected to channels 2 and 3. 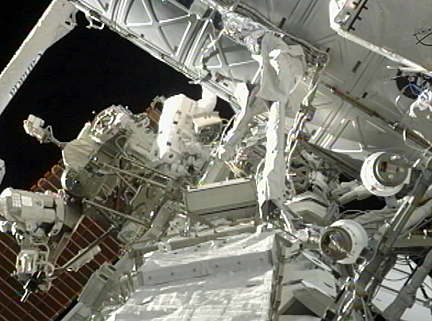 After the first set of cables is installed, the astronauts will hook up wiring for antennas installed during the crew's first spacewalk before pressing ahead with installation of jumpers for power channels 2 and 3. Running about a half hour ahead of schedule, astronauts Andrew Feustel and Michael Fincke have mounted a robot arm power and data grapple fixture, or PDGF, to the Russian Zarya module. The PDFG eventually will allow the station's Canadian-built robot arm to attach itself to the Russian segment of the space station to assist spacewalkers or provide visibility into previously inaccessible areas. Feustel and Fincke now are working to install a video signal converter to properly format television signals from the robot arm for relay to the U.S. segment through Russian hardware. Astronauts Andrew Feustel and Michael Fincke, floating in the International Space Station's Quest airlock, switched their spacesuits to battery power at 1:43 a.m. EDT (GMT-4) to officially begin a planned six-and-a-half-hour spacewalk, the third of four planned by the shuttle Endeavour's crew. "It's great to be back outside," Fincke marveled. "The most beautiful planet in the universe." "Nice view, isn't it?" Feustel agreed. For identification, Feustel, call sign EV-1, is wearing a suit with red stripes around the legs while Fincke, EV-2, is wearing an unmarked suit. The primary goals of the spacewalk are to mount a power and data grapple fixture on the left side of the Russian Zarya module that can be used later as a base for the station's Canadian-built robot arm. The astronauts also plan to install wiring between the U.S. and Russian segments of the station to improve redundancy in the system that feeds power from the lab's NASA-supplied solar arrays. 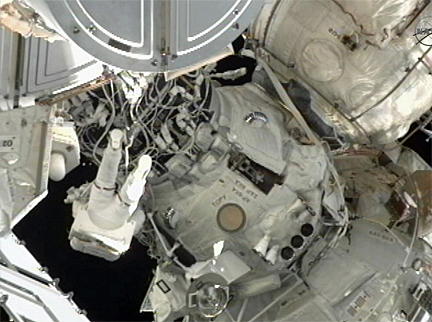 Feustel and Fincke plan to install a video signal conditioner for the power and data grapple fixture; to finish connecting wiring needed by new antennas installed during the crew's first spacewalk; and to carry out photo documentation of experiments mounted on the station's power truss. In a departure from past practice, the astronauts followed a new pre-spacewalk protocol to purge nitrogen from their bloodstreams to prevent the bends when working in NASA's 5-psi spacesuits. Unlike the "campout" protocol used for scores of previous spacewalks, the "in-suit light exercise" pre-breathe protocol, or ISLE for short, does not require the astronauts to spend the night before sealed in the station's airlock at a reduced pressure of 10.2 psi. Instead, the astronauts perform light exercise while breathing pure oxygen the morning of the spacewalk. "We think this is an improvement over the campout protocol," said space station Flight Director Derek Hassmann. "And of course, the main thing we're after here is crew safety. All of these crew protocols are designed to prevent the bends. Leading up to this, we put the ISLE protocol through all the standard medical reviews and tests that both the campout and exercise pre-breathe protocols have been subjected to, and everybody's comfortable it's completely safe. We think it offers some significant advantages." This is the 158th spacewalk devoted to station assembly and maintenance since construction began in 1998, the seventh so far this year, the eighth for Fincke and the sixth for Feustel. Going into today's excursion, total station EVA time stood at 988 hours and 19 minutes, including 14 hours and 26 minutes for the Endeavour crew's first two spacewalks.